Edmund Charles Tarbell (1862 – 1938), the famed American Impressionist painter, completed Three Sisters – A Study in June Sunlight in 1890. The painting, having stirred excitement and debate in the art world from its first appearance, was acquired not long after its completion by Mrs. Montgomery Sears. So, how did Three Sisters find its way from one of the most important art collections of the early twentieth century to a fledgling art institute in the Midwest? Among a number of interesting connections, John E. D. Trask, director of the Institute from 1924-1925, had managed a gallery on the east coast where he became acquainted with Tarbell and a frequent exhibitor of his work. In addition, Trask had written a number of articles about Tarbell for popular art magazines of the day. Perhaps the most significant connection however, is that upon assuming the post of director, Trask wrote to several artists seeking donations of preparatory sketches, drawings, water colors, etc. In his letter, Trask explained that “a collection of serious sketches and studies would be of great educational value helping to ‘demonstrate to the public the real effort which precedes the production of any serious work and the futility of – the art made easy – idea’” (1). Although his letter focused on the acquisition of artist’s preparatory items, Trask’s bold request brought the young Art Institute to the attention of artist’s and their patrons nationwide. While we may never know every detail of the Three Sisters acquisition, the path traveled by artwork from creation to gallery walls is often as fascinating as the artwork itself. To learn more about Edmund Tarbell’s Three Sisters – A Study in June Sunlight, 1890, visit its collections page on our website. 1 “Gifts Come Generously to Gallery.” by J. K. Journal, March 22, 1925. This entry was posted in Art, Library/Archives. Bookmark the permalink. 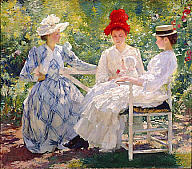 1 Response to How did the Milwaukee Art Institute acquire Edmund Tarbell’s “Three Sisters – A Study in June Sunlight”, 1890? My Mother obtained this art work about a month or so ago from a shop here in our city. It has a label on the back and everything. We were on here doing some research and found your page. Could you contact us with information if any? We would really like to know if this painting that my Mother obtained is worth money and could be sold.